When it comes to sports fans and their beloved stadiums, change is sometimes hard to take, especially at historic venues like the Chicago Cubs’ beloved Wrigley Field. 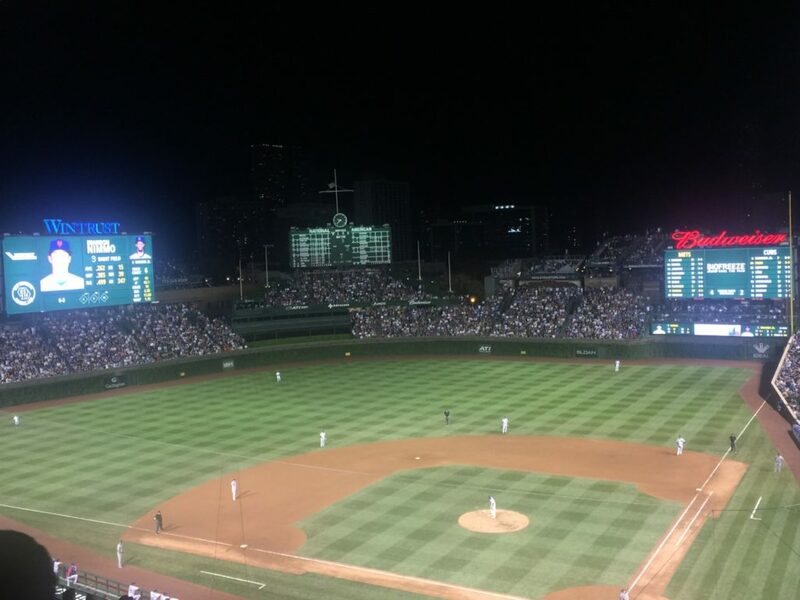 The last ballpark in the major leagues to get lights (in 1988), fans of the iconic Wrigley with its ivy-covered outfield walls put up some fierce resistance to some of the latest changes brought to the ballpark by the team’s latest owners, the Ricketts family, ove the past few years. An expansion of the bleacher seats, some new video boards behind the stands in the outfield and construction of a hotel and office building adjacent to the stadium all had their naysayers, some of whom would still prefer the old to anything new. 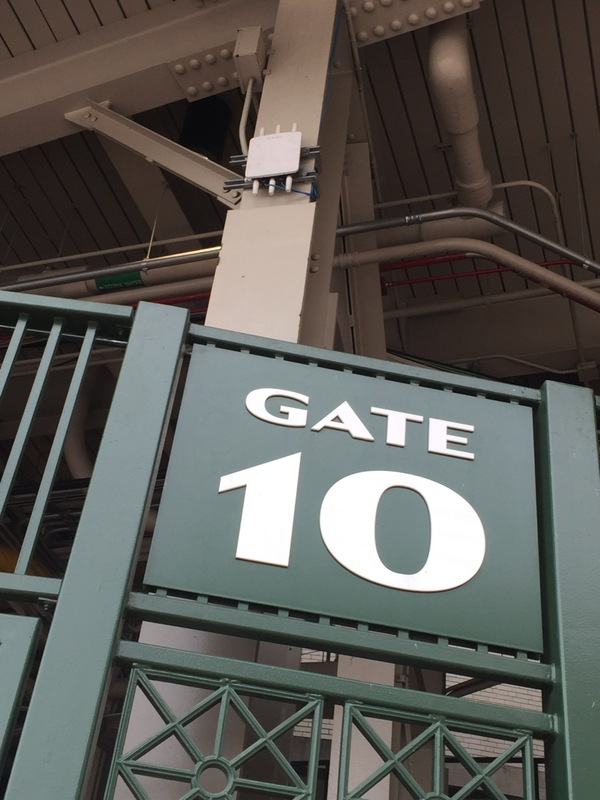 But this season, Wrigley is finally unveiling a part of its renovation that everyone can get behind — better cellular connectivity inside the park thanks to a new neutral-host distributed antenna system (DAS) built by DAS Group Professionals (DGP) for the Cubs. 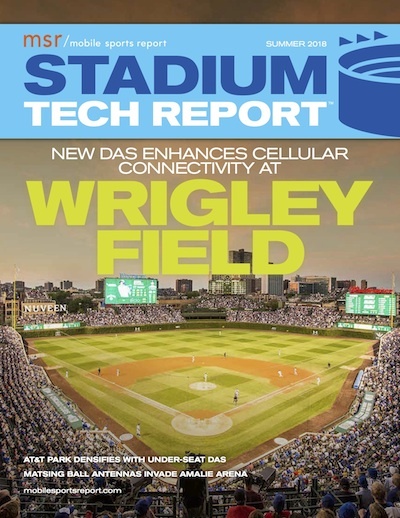 Delayed a couple years from its originally planned deployment due to the Cubs’ World Series title run in 2016, the new system has contracts with all four of the major U.S. wireless carriers, and should help fans share more memories from the Friendly Confines in the seasons to come. 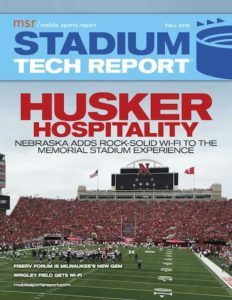 Editor’s note: This profile is from our latest STADIUM TECH REPORT, an in-depth look at successful deployments of stadium technology. 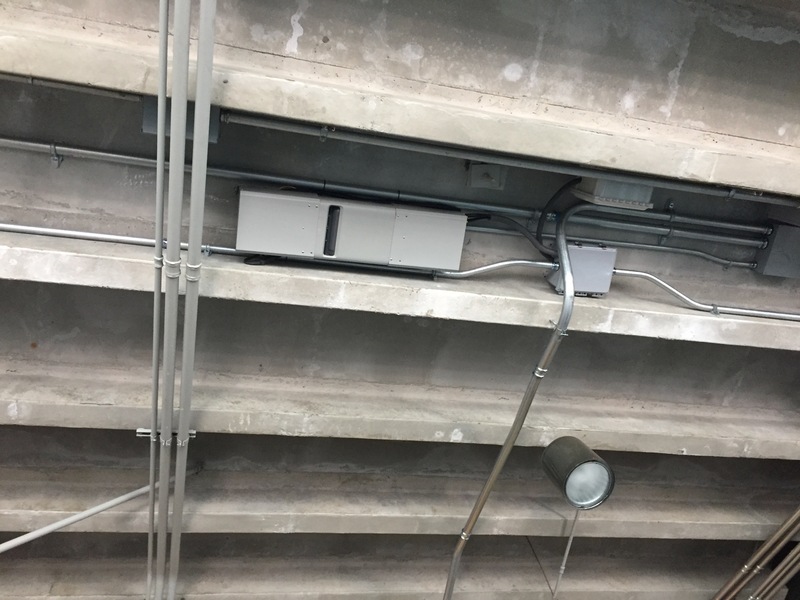 Included with this report is a profile of a new MatSing ball DAS deployment at Amalie Arena, a new under-seat DAS deployment for the San Francisco Giants at AT&T Park, and a look at the networks inside the new Banc of California Stadium in Los Angeles! DOWNLOAD YOUR FREE COPY now! 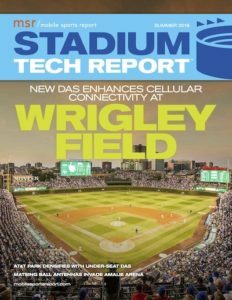 First announced in 2015, the plan to bring the new DAS as well as a new Wi-Fi network to Wrigley was pushed back until this season, mainly because of the Cubs’ new-found success on the field. In addition to the World Series title in 2016 — as everyone knows, the Cubs’ first in 108 years — the Cubs also went deep into the postseason in both 2015 and 2017, reaching the NLCS in both those years. As the extended seasons pushed back all kinds of renovation construction schedules, the arrival of the new connectivity options was pushed back a season longer than expected — a delay that was felt but perhaps not minded all too much by the celebrating Cubs fans. 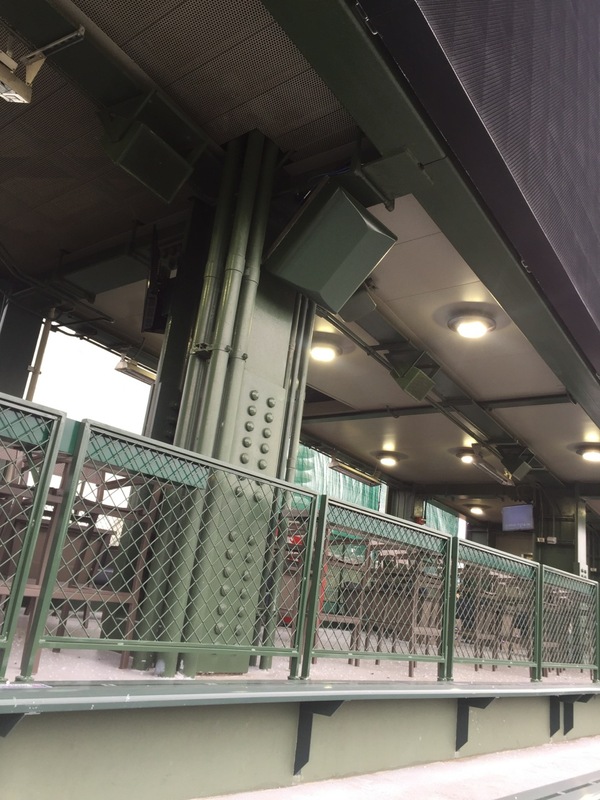 Since deployment of the DAS was (mostly) fairly straightforward — the DGP deployment uses entirely overhead and side-structure antenna placements, thanks to Wrigley’s multiple overhangs — it was finished in time for opening day. The Wi-Fi network, however, will be rolled out as the season progresses, mainly due to the need to place APs under seats in the lower seating sections. Much of the engineering to get both systems inside the stadium faced more than the regular share of stadium conflicts, as this past offseason saw the Cubs pull out almost all the lower-bowl seats and dig 60 feet down into the dirt to clear room for some under-seat club areas, one of which is already open. 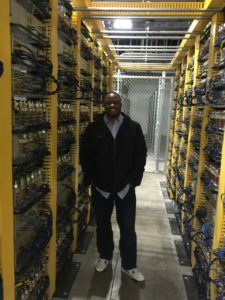 Even though the DAS network wasn’t powered up until about a week before the season’s first pitch, deadlines were met and the new celluar system was ready for opening day. 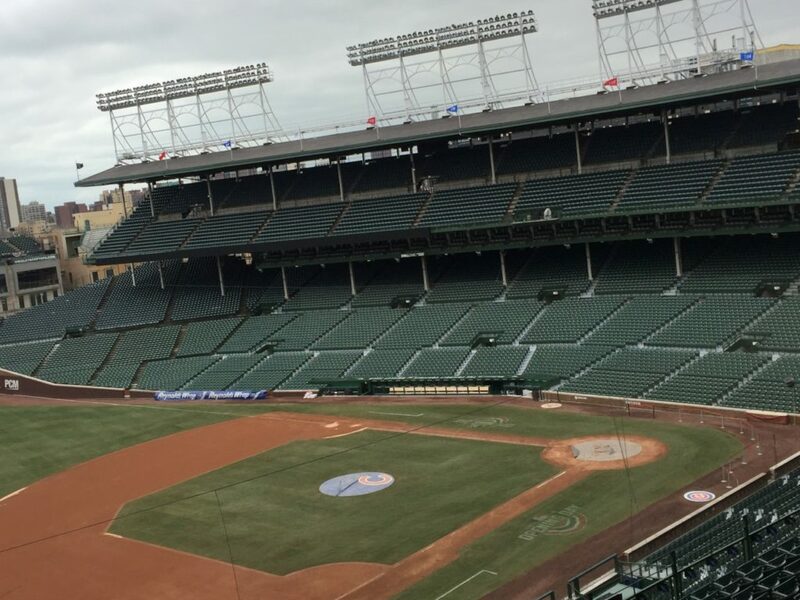 “We definitely put scheduling and timing to the test, but we got it done,” said Andrew McIntyre, vice president of technology for the Chicago Cubs. “By the All-Star break, we should have both systems online,” McIntyre said. “We worked around all that and got it done,” said Dutto. Mobile Sports Report traveled to Chicago for a mid-April visit, hoping to get some sense of the new network’s performance on a full-stadium game day. Instead, we got a lonely and chilly tour when sub-freezing temperatures caused that day’s game to be canceled. One positive was that with empty stands, it was easier to get around and see all the DAS antenna placements. New flat-panel DAS antenna blends nicely in club space. The first part of our tour was a trip underground to the new 1914 Club (for the year Wrigley opened) that sits directly under the seats right behind home plate. 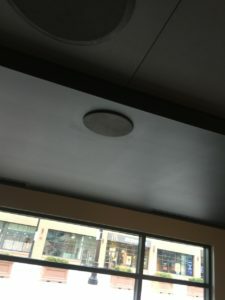 With the feel of sports bar-meets-speakeasy, the classy premium-seat space has great connectivity even while underground, thanks in part to a new flat-panel disc-shaped omnidirectional DAS antenna from Laird Technologies that DGP used in both indoor and outdoor placements. With nobody in the club, we got an off-the-scale speedtest of 139 Mbps down and 46.7 Mbps up, proof on one level that the system is ready to go. Since it was freezing outside (did we mention it was cold?) MSR didn’t stop to take our gloves off to get many more tests, but we did get marks in the high 30 to high 40 Mbps range pretty much anywhere we did stop, including the upper decks and the bleachers. Even out in the middle of the adjacent plaza (where the Cubs’ networks are designed to cover) we got a DAS speed mark of 38.2 Mbps / 44.0 Mbps. “The new DAS is much more higher performance grade than in the past,” McIntyre said. 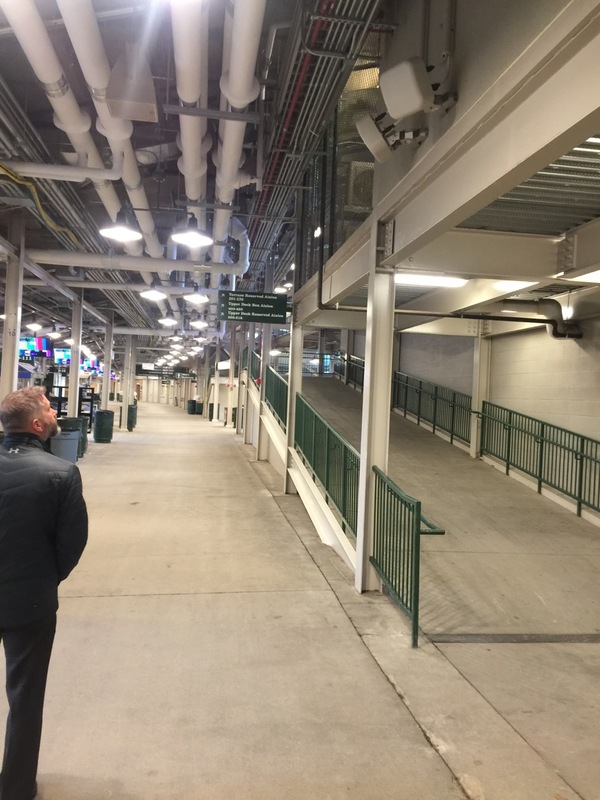 The premium-seating club spaces, which were previously nonexistent at Wrigley, will expand next year when the Cubs finish out two more underground spaces, along each base line. According to McIntyre fans in those clubs will be able to watch players using the underground batting tunnels to tune their swings mid-game. The last phase of the current Wrigley renovations will also see the addition of some more open gathering and club areas on the upper deck level, including party porches on the outside of the stadium walls overlooking the plaza (now called Gallagher Way under a sponsor-naming deal with the Illinois-based insurance brokerage). Gallagher Way, which hosted an outdoor ice rink in the winter, is set to hold concerts and other gatherings like movie nights this summer. Sometimes in stadium wireless retrofits, you get lucky and the old stuff blends pretty well with the new. 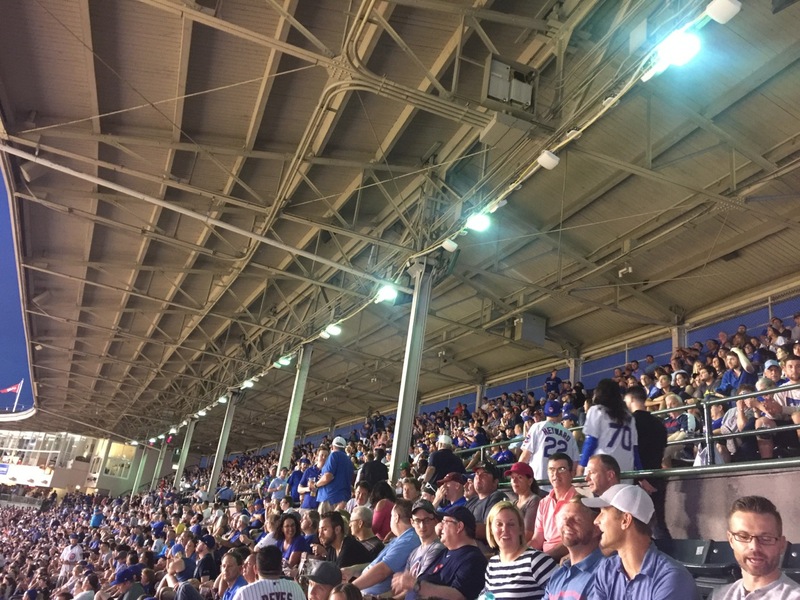 Take Wrigley Field’s classic metal-and-wood overhangs, which provide shade and rain cover for fans on the lower back and upper decks. According to DGP vice president of engineering Derek Cotton, getting DAS antennas in the right spots for a good signal there was half easy, half hard. On the top levels, DGP was able to install the JMA gear out where it could offer the best connection — at the edge of the roofs, pointing backward toward the stands. 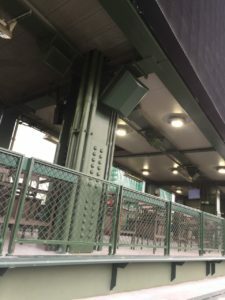 With aesthetics a top concern at Wrigley, the roofs were a perfect place to “hide” some of the 420 total antennas in the deployment. 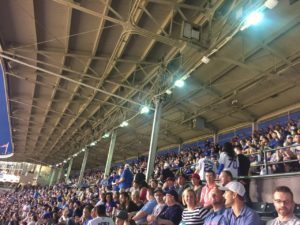 But on the lower-level roof, DGP and the Cubs had a concession to make that will be fixed during the upcoming offseason. Because of the deep pits dug into the box seat and field level, Cotton said DGP couldn’t get a scaffolding set to reach the outer parts of the lower roof — so instead DGP put those antennas in toward the backs of the roofs, and will move them out to the edges this winter. Some other antennas installed this year will have to be taken out and replaced while the rooftop party decks get built; and by next year the Cubs hope to have all the marooned gear from an AT&T Wi-Fi deployment from 2012 removed — but if you have sharp eyes this summer you can spot some of the old “Pringles can” Wi-Fi radios still nestled up in the rafters. 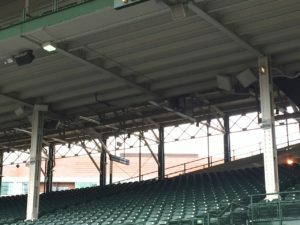 If DAS deployment in the main seats at Wrigley was fairly straightforward, for the venue’s unique and famous bleacher seating DGP’s Cotton said “some creativity was needed” to find places to mount antennas. 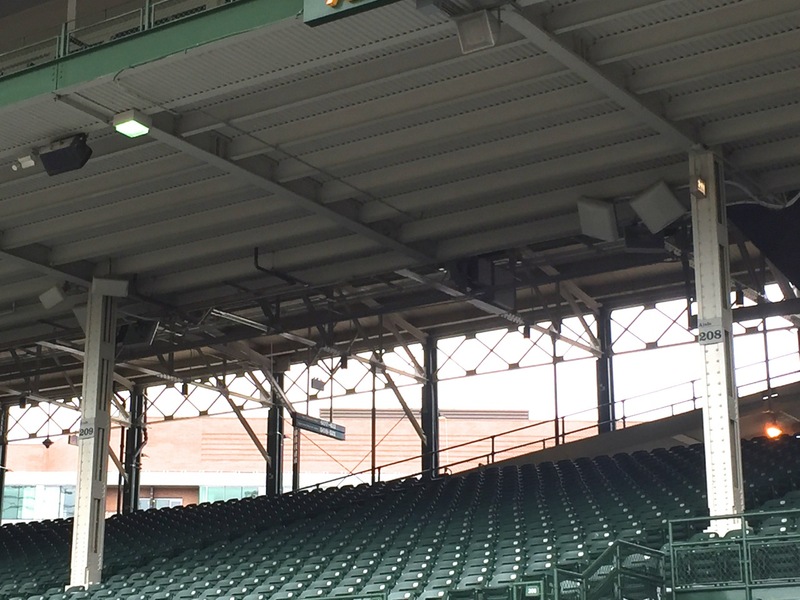 With no overhead structure and only the historic, manually operated scoreboard in the back, Wrigley’s bleacher seating now has DAS coverage from a wide array of antenna placements that took use of just about every kind of mounting area available. Some gear hangs from the back of a sponsor’s sign in left field; other antennas are tucked underneath the bottom of the scoreboard, pointing out from a small club area there; and still others are concealed in the tall grass of the planters that go up the sides of the centerfield seating section, just next to the poles that carry the Cubs’ World Championship flags from 1907, 1908, and most recently, 2016. Other more normal antenna placements are found around the back side of the bleachers, where recent renovations added a concessions area and more stairways. Moving outside the park to the plaza, artistic concealment continues with antennas hidden on light poles that surround the triangular plot of lawn. 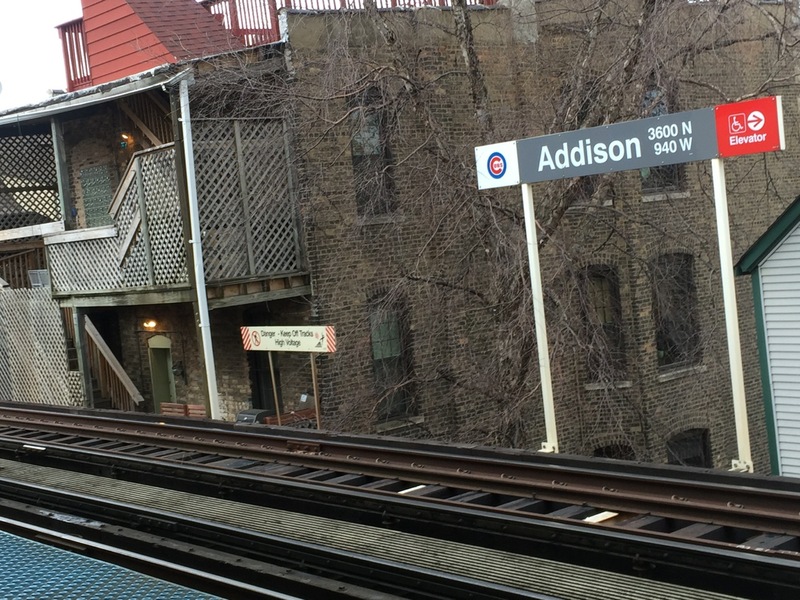 According to McIntyre, the club’s wireless coverage extends across Clark Street to the new Hotel Zachary, named for Wrigley Field’s original architect, Zachary Taylor Davis. The hotel, which has retail shops on the street level — including a McDonald’s franchise that replaces a standalone McDonald’s that used to sit in the parking lot where the plaza now stands — has DAS coverage on all floors, with Wi-Fi planned for public spaces on the first floor and second floor, where the main lobby and lobby bar reside. 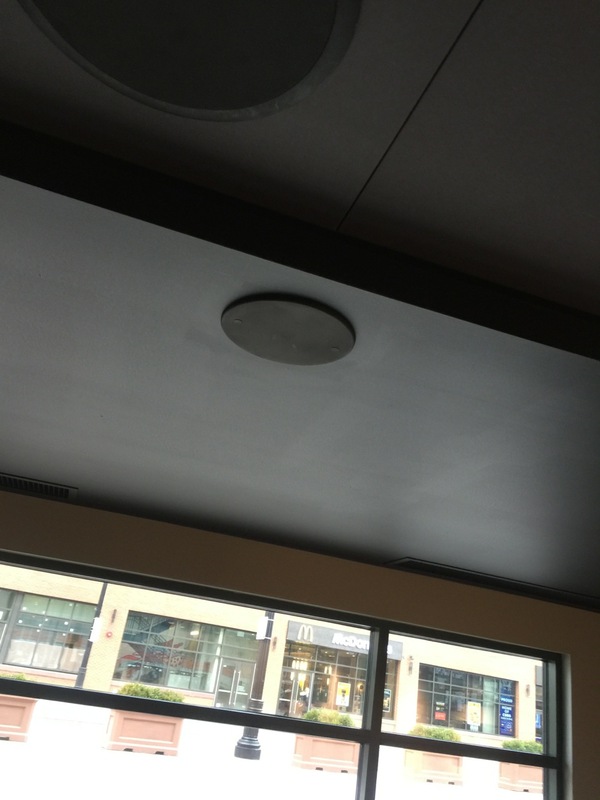 In the lobby bar comfortable couches provide a great place to look over the plaza and at Wrigley; and in fact the Extreme Networks Wi-Fi gear visible on the ceilings is already operative there, though purposely limited in throughput to 7.5 Mbps up and down for now. 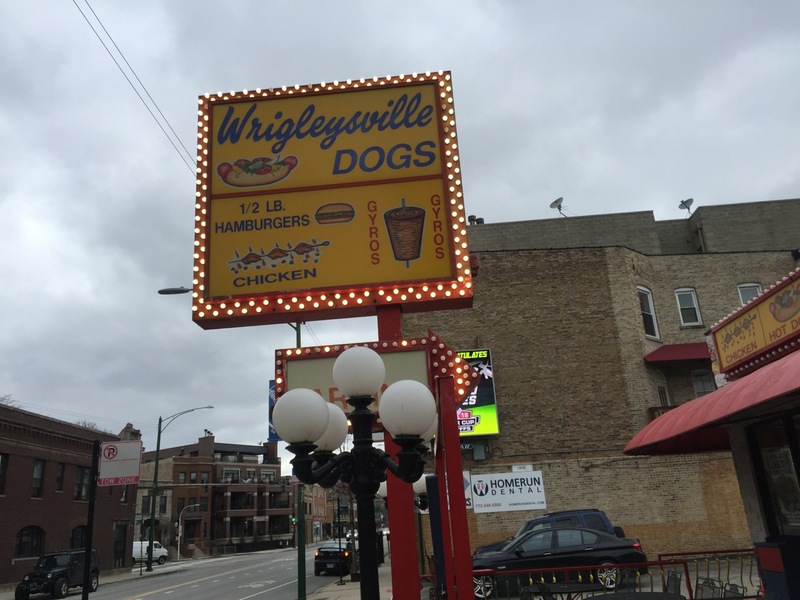 Most of all the wiring for the new networks comes together in a small brick headend building about a block north on Clark, behind the Wrigleyville hot dog stand. Unless you knew what was inside, you’d be hard pressed to guess why there are huge strands of red, white and blue cabling coming through one wall. 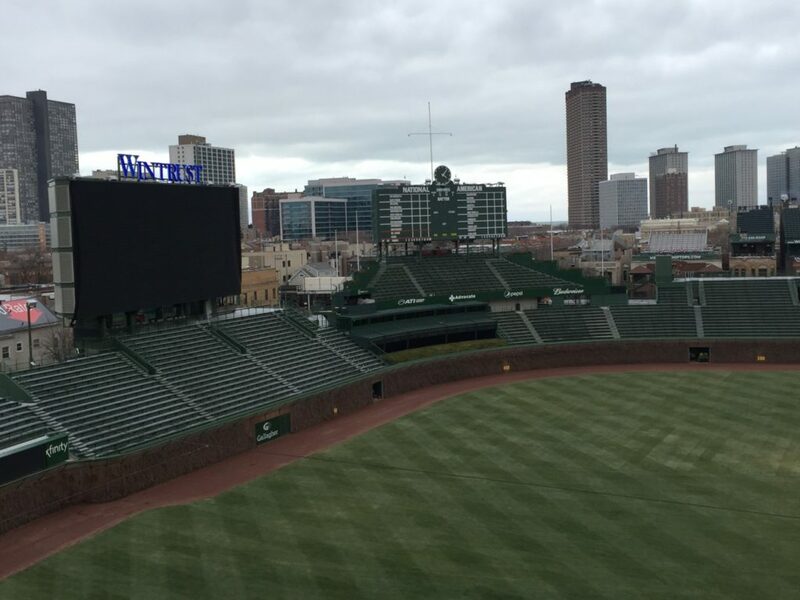 Just before the start of the season, the Cubs announced a deal with Comcast Business that will see a “XfinityWiFi@Wrigley” label on the Wrigley Wi-Fi SSID. 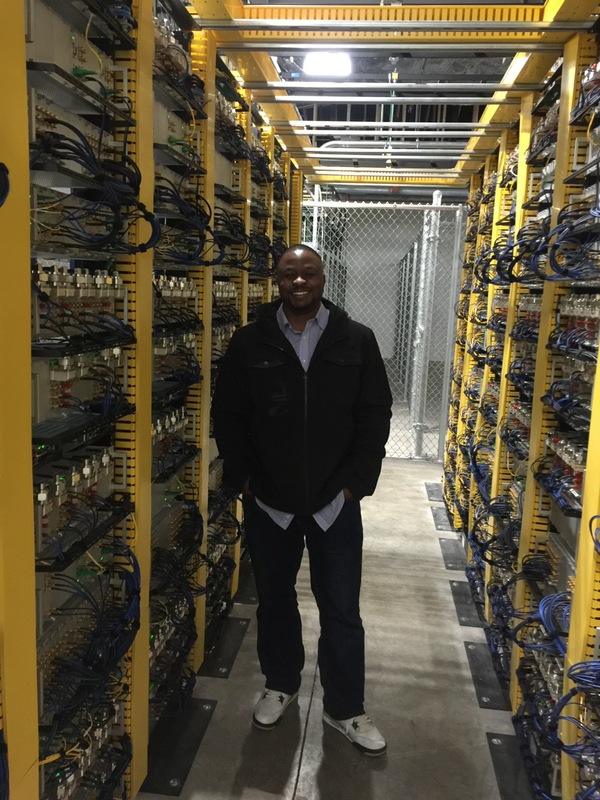 According to McIntyre Comcast will bring in twin 10-Gbps pipes to power the Wrigley Wi-Fi network. When the Wi-Fi network comes online later this season, there will be even less of a reason to believe there will be any more grumbling about connectivity at the Friendly Confines. The new era starts with the DAS deployed by DGP, which was picked by McIntyre and the Cubs several years ago, after hearing of DGP’s deployments at Levi’s Stadium and over face-to-face meetings at the SEAT Conference. And while Cubs fans didn’t have to wait for new wireless as long as they did for a world championship, they can now start enjoying the ability to connect to the world outside the ivy. 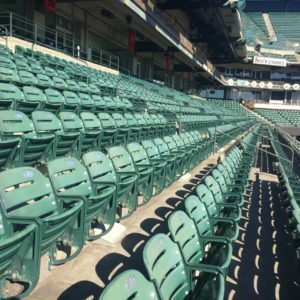 An offseason experiment by AT&T and the San Francisco Giants may change the way sports venues and carriers think about cellular deployment, as a massive installation of under-seat antennas has significantly improved the cellular capacity at AT&T Park for AT&T customers, according to the team and the carrier. 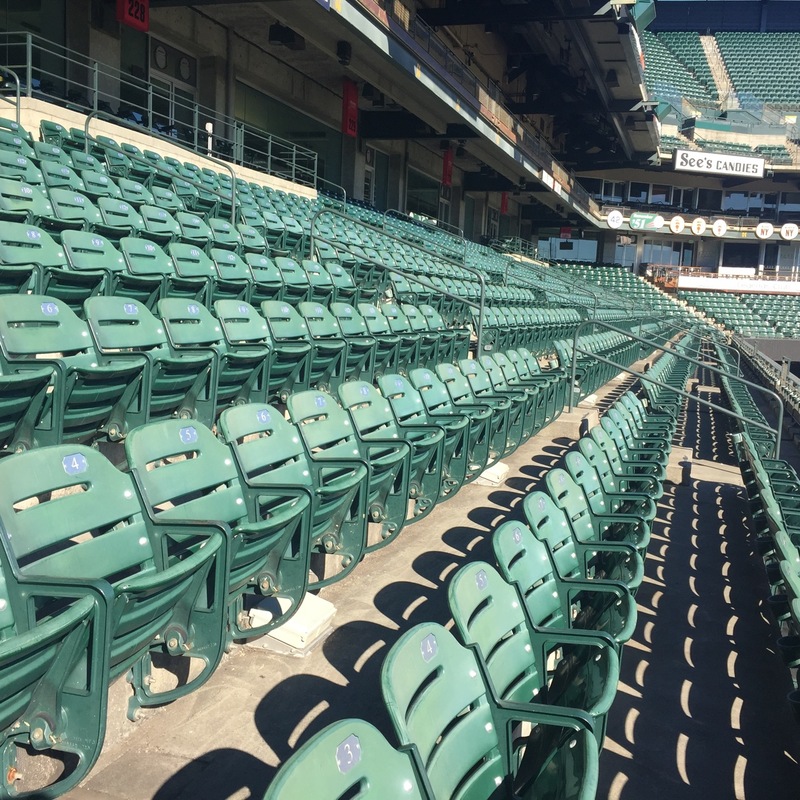 By installing cellular antennas inside 916 existing under-seat Wi-Fi antenna enclosures, AT&T and the Giants made a huge bet that by densifying the coverage, they could significantly improve the cellular experience for AT&T customers at the ballpark. While admitting that data accumulated so far is only a small sample, the Giants and AT&T are nonetheless convinced their move is already a win, as early season declines in Wi-Fi use and increases in cellular data use seem to point toward a conclusion that fans are using more cellular service because it’s providing a better connection. The change is so effective that it’s even making the Giants’ networking team wonder if Wi-Fi will be necessary moving forward, if other carriers added the same kind of network capacity to their cellular infrastructures. With technologies like the multiple proposed iterations of 5G cellular and other plans to mine new spectrum territory on the near horizon, large public venues looking to keep up with wireless data demands are seeking whatever ways they can to keep customers connected. 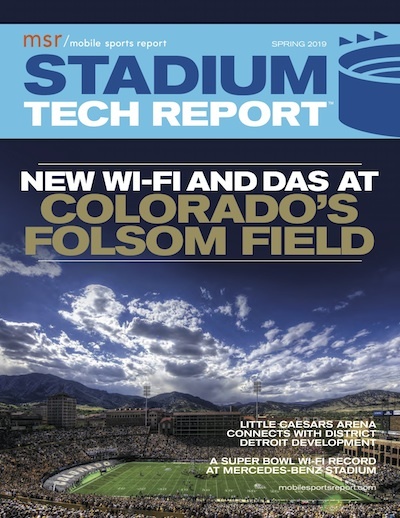 Historically, AT&T Park has been in the lead in this arena, from being the first pro venue to provide Wi-Fi to fans (in 2004) to staying committed to pushing the envelope, including the pioneering move of putting Wi-Fi access points under seats to improve and expand coverage. 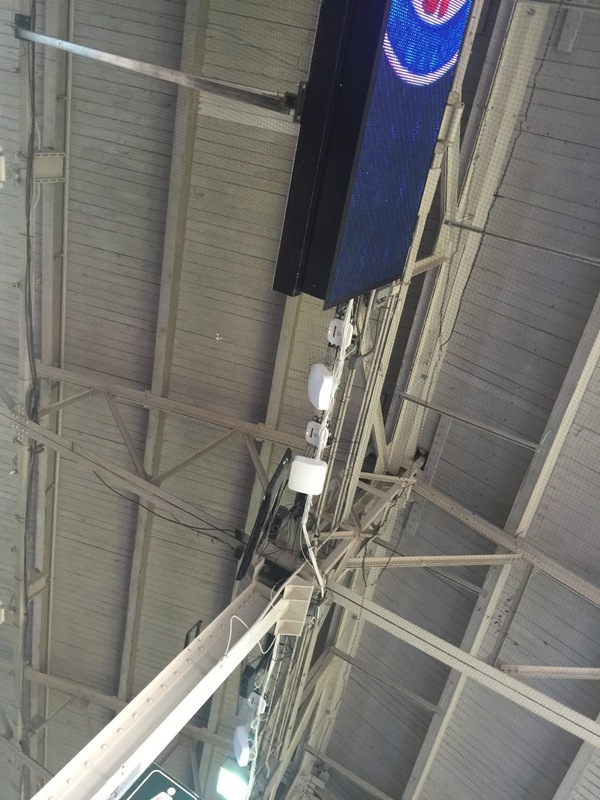 As the neutral-host provider of a distributed antenna system (DAS) at AT&T Park to provide cellular coverage for its own customers as well as customers from all the top wireless service providers, AT&T has also kept its cellular systems at the top levels of performance, at least at the levels possible for traditional top-down antenna placements. However, as demand for wireless services keeps growing — pushed somewhat by the recent revival of so-called “unlimited” data plans — many large venues (especially those facing “bucket list” events like Super Bowls or World Series games) have been challenged to find ways to expand DAS capacity. At the past three Super Bowls, Verizon Wireless has increased DAS capacity by using extra DAS antenna installations under seats (Super Bowl 50, Levi’s Stadium), under seating-area concrete (Super Bowl 51, NRG Stadium) and inside handrail enclosures (Super Bowl 52, U.S. Bank Stadium). According to Bill Schlough, senior vice president and chief information officer for the Giants, the team and AT&T conducted a small experiment last fall, to see if putting cell antennas inside the existing under-seat Wi-Fi enclosures could help provide a better signal for fans. “We did a small swath of stands and it worked well,” said Schlough in a recent phone interview. “So we said, ‘let’s do the whole ballpark.’ ” Some 916 antennas later, installed by crews who worked every day of the offseason, AT&T Park had what Schlough called “our most significant connectivity upgrade, ever,” no small statement for a network that has required more than $30 million in spending in its existence, according to Schlough. What’s kind of funny is that this paradigm-changing “experiment” has so far only netted a one-paragraph simple explanation in a “What’s new” public press release from the Giants and AT&T Park. If the Giants and AT&T seem to be soft-pedaling the deployment a bit, some of that modesty may come from the fact that this deployment may not be easy to replicate. Gordon Spencer, an area manager in AT&T’s RAN engineering group, said the deployment uses only spectrum from the WCS band, a chunk of wavelengths near the 2300 GHz region. None of the other top carriers has any licensed spectrum in this band; by using only WCS wavelengths, Spencer said, AT&T easily avoided any interference with its existing DAS, which uses a number of more-common cellular frequencies. There was also a huge construction savings by using the existing under-seat Wi-Fi infrastructure, which meant there was no extra core drilling necessary to deploy the new cellular devices. 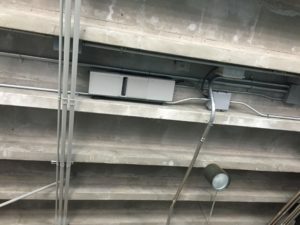 Another part of the program AT&T is reluctant to talk about is how exactly it got the WCS antennas to work inside a Wi-Fi box, without having to open up the boxes from the top. Spencer would not comment about specifics of the antenna deployment, but did say that having WCS spectrum close to the unlicensed 2.4 GHz spectrum used by some Wi-Fi communications “made construction pretty simple.” Like under-seat Wi-Fi, Spencer said the under-seat cellular network designs in the interference caused by human bodies (aka “bags of water”) to allow antennas to be placed closer together. “It works much better when the stadium’s full of people… we designed it that way,” Spencer said. Could more dense cellular replace the need for Wi-Fi? While the public press release doesn’t give any exact throughput numbers for proof, it does state that “This densification initiative effectively triples wireless capacity for AT&T customers at AT&T Park,” and notes that approximately 32 miles of fiber and copper cable were used to enchance 97 cell sectors. But since AT&T customers typically are in the majority at most AT&T Park events, by moving many of them to a new network, the team was able to effectively free up space on the regular DAS as well as on the Wi-Fi, a network Schlough said could soon fall out of favor. 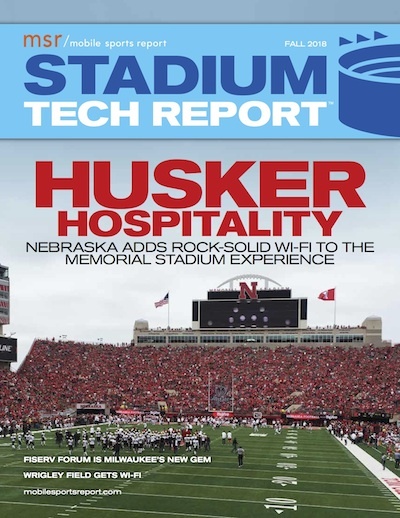 Some venues, of course, may want to keep expanding their Wi-Fi systems since by owning the network they also own the network user data, a trove of information not usually shared by wireless carriers for DAS usage. But unlike some theoretical 5G designs — which may call for “microantennas” in a much larger number — the more-dense via piggybacking on Wi-Fi idea may have some legs.